Do you want to learn how to make your own remote control and program it in Python? If you follow the tutorial we’re about to share, you’ll be controlling devices remotely in less than an hour. It seems that the combination of Zerynth Studio and XinaBox xChips is getting more popular every day. We wrote about a tutorial for gesture and proximity sensing devices the other day, which use the same combination of tools. So, now we’re super excited to share another tutorial with you. 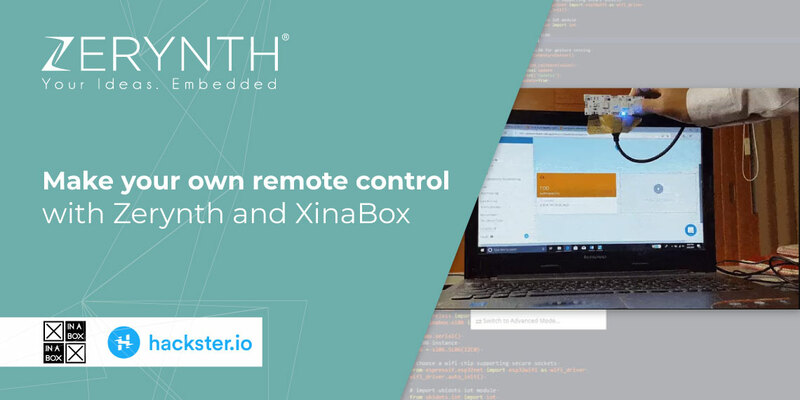 This time it’s for remote control with XinaBox xChip SH01, a capacitive touch sensor, Ubidots, and Zerynth Studio. CW02 – contains a dual-core ESP32 microcontroller by Espressif Systems, that has both WiFi and Bluetooth Classic/LE support, 4 MB of SPI Flash, and a tuned antenna. IP01 – an interface module which is equipped to power and program other modules via a USB A connector. Add Zerynth Studio and Ubidots to that list, and you’re good to go. As you probably already know, the CW02 xChip has a Zerynth Studio license onboard. That means you can start programming it right out of the box. All you need to do is enter a voucher code during the registration phase of the device. You can learn more about it here. But that’s not all. We’ve got another interesting article to share with you. One that explores the possibilities of programming the AH01 xChip in Python, with Zerynth Studio. In a tutorial called “Introduction to XinaBox xChip AH01(ATECC508A) with Zerynth” you’ll go through simple diagnostic functionality exercise. The xChip AH01 has many applications in security, especially for the IoT Node security and ID used for connecting to IoT platforms such as Google IoT, Microsoft Azure, Amazon AWS etc. It won’t take up much of your time, less than 10 minutes actually. Now, all you’re left to do is download Zerynth Studio and start making your remote control. It’s free to download and available for Windows, Linux, and Mac OS.